On October 31, 2015, at the age of 80, Frank Nicoladis added a new line of business to the company he founded in 1969. 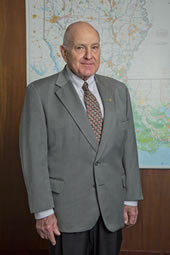 With N-Y Associates, Inc.’s completion of a Scenic Byways Master Plan for Louisiana’s Zachary Taylor Parkway, Frank extended his company’s national reputation for excellence in engineering, architecture, planning and program management. N-Y Associates, Inc.—the company that Frank originally established to provide civil engineering services within the New Orleans metropolitan area—has evolved over the decades to become a comprehensive, multifaceted authority on enhanced environments. The Zachary Taylor Parkway Commission recognized this expertise in their selection of N-Y Associates, Inc. to develop the plan, because the company understood that a scenic byway is more than just a road with nice scenery. Rather, when thoughtfully designed and implemented, it offers visitors an experience and the communities along the route an economic revitalization. Making this all come together takes more than great planning and execution. The most important element to make it all work is the one that Frank brought to the table: experience … years and years of experience. For those who seek to grow and learn in life, every experience is an opportunity to advance our base of knowledge. Did the outcome precisely match your expectation? What might you have done differently if given the opportunity? This process of experience, reflection and adjustment is essential to the development of expertise. Life experience grants us the opportunity to notice small details we might have missed that can often make a big and positive difference in the future. Frank is an example of what can be attained when we fully embrace this process and always strive to improve. Frank’s life experience has fostered expertise—and a burgeoning business that continues to improve our quality of life. Frank Nicoladis … Peoples Health Champion.